Knights of The Black Lily is a brand new Pen & Paper RPG featuring a custom fantasy genre simulation system of medium complexity (rules-medium). The game’s core philosophy is challenge within genre bounds: it provides the GM with every tool required to continually setup both interesting and challenging situations for the players – while giving the players all the incentive to solve those challenges the way your favorite characters from fantasy fiction would have. 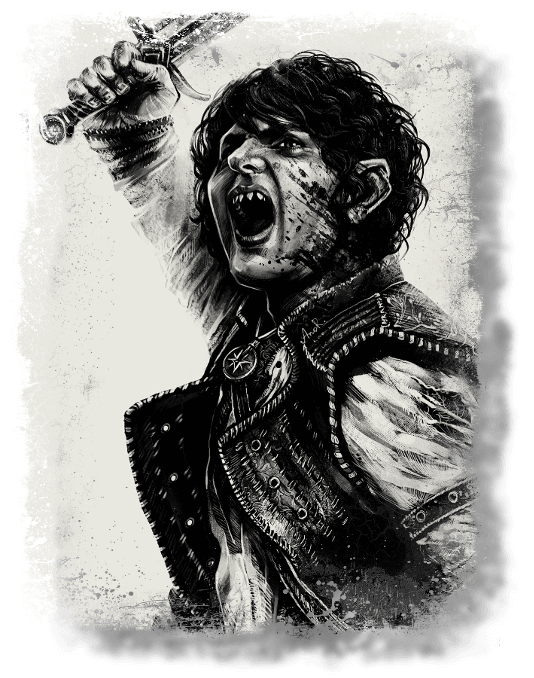 From attempting to scale the Soot Rocks of K’winryth over trying to weather an Ogre’s onslaught behind your shield blow-for-blow to uncovering who slit the throat of the Halfling-Tyrant of Babel – Knights of the Black Lily dares your players to overcome any such challenges while drawing on hero’s luck as little as possible. If you are curious about not just testing the mettle of the characters but that of your players as well or if you’re intrigued by the idea of recreating fantasy stories as faithfully to the genre as possible, then Knights of the Black Lily is the game for you! combats that develop their own story. The core mechanic of Knights of The Black Lily is what we call the Bell-Curved D100. Combining the simplicity of the D100 with the gently rolling distribution curve of multi-die mechanics (e.g., 3d6) in one, it is ideal for producing both easily understood success chances and plausible test results. For example, a masterly-forged sword (+1 bonus) will not do very much for someone entirely unskilled nor for a swordmaster – while giving quite a decent bonus to most other combattants. A beginner will do poorly with any sword just as the swordmaster is likely to hit with or without. However, the swordmaster might find it easier to bypass the enemy’s parries with such a magnificent blade! You can have grim and gritty and fantastic adventures within the dystopic setting of Knights of The Black Lily just by using the basic rules. But fantasy heroes don’t just possess courage and skill – they also rely on hero’s luck to help them out in critical moments! For example, a magic ring that slips onto the hero’s finger, a foe’s sword breaking in combat or a hail of enemy arrows all missing in battle – even the greatest of fantasy heroes have been protected by such plot armor time and time again. Knights of the Black Lily not only reflects these genre conventions but also supports you in using hero’s luck to set up exciting challenges for your players: by keeping track of how much luck the PCs use, they will either receive rewards or face complications at the scenario’s highpoint (more details on that can be found here). Combat: Can your party of young Misfits rout a black dragon and resort to hero’s luck less than six times? 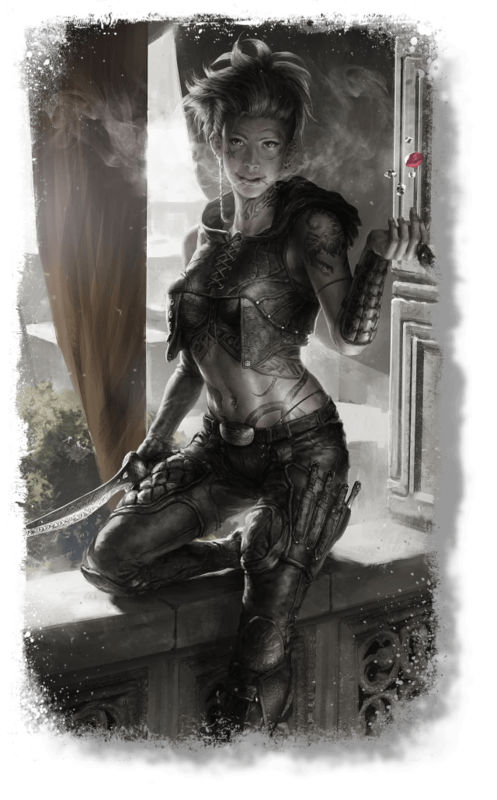 Social: Can your party discern the motivations of the Spider-Queen of Uleth and sway her without invoking hero’s luck to redirect the conversation more than once? Remember that only you, the GM, gets to determine where and when to challenge your players with such a wager – and when to run a scene entirely without. You can freely mix scenes that keep track of hero’s luck with scenes that don’t or even with scenes in which the players have no hero’s luck pool to rely on at all! The challenge-driven design presented above simply widens the GM’s toolbox for testing the mettle of both the characters and their players, making for more intense adventures and for longer lasting campaigns! Next, we’ll have a look at how you can make your players care about mastering your challenges to begin with. Any challenge you create is only as thrilling as the stakes involved – and the stakes may vary according to circumstances and the scope of the challenge. As an example for common stakes in fantasy games, a scene involving a diplomatic mission before the thorny throne of the mad elf king Alasthir (who deigns himself among the Dark Pantheon on less lucid days) might involve the risk of immediate breakdown of negotiations. 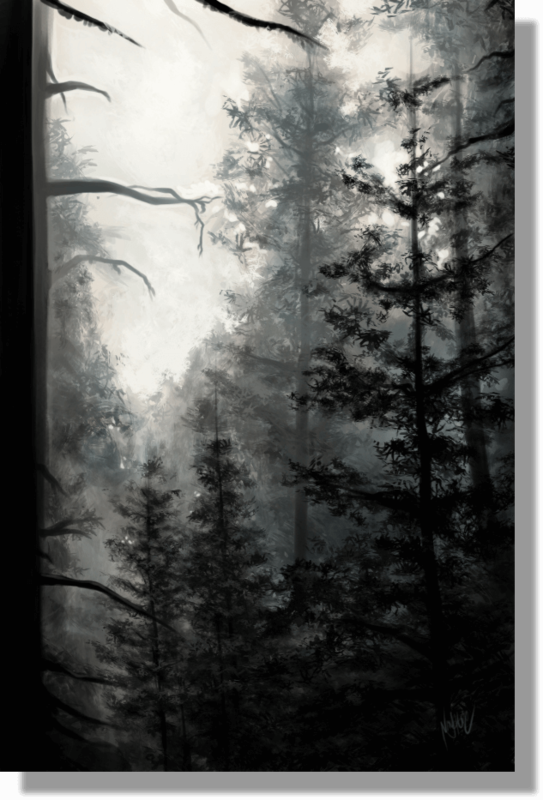 But in Knights of The Black Lily there is much more to challenging your players than that. By default, the game keeps track of hero’s luck used up over the course of an entire scenario. And at the narrative’s climax, just before the adventure draws to its dramatic conclusion, the dark gods take stock of how much hero’s luck they had to grant! In their perverted views of things this means that parties will be rewarded or penalized depending on how much hero’s luck has been resorted to. The fate of NPCs: Can you save the half-demon princess G’dala from a band of rebellious elves just in time? Recurring Villains: Will Drur-Uruk, the spiteful one-eyed paladin of Chieftain Akmon D’rar, escape and become recurring? 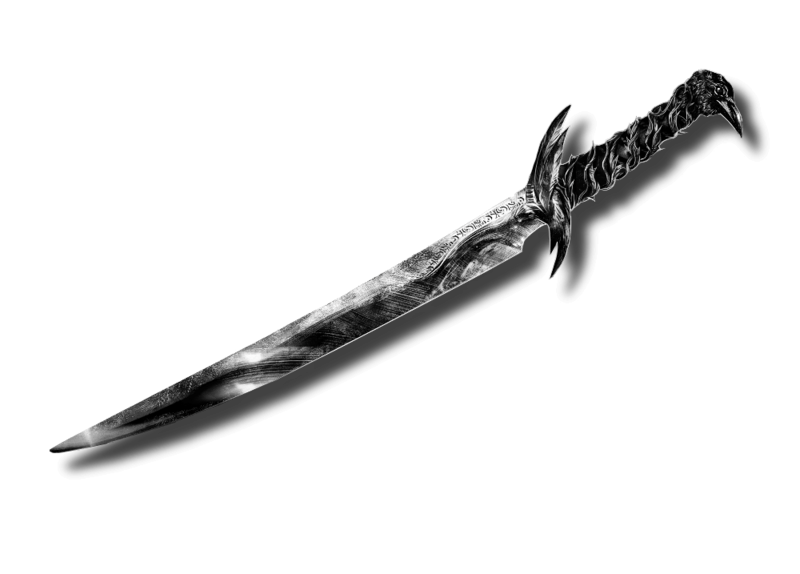 Loot: Granted the legendary blade ‘Feenmark’ to banish the lich count of Urick, will you be able to keep it after the quest is done? Third Parties: Will the mysterious worshippers of Ka’dash, dead god of thieves, side with or against the party at the final battle? In Knights of the Black Lily, you can make your players bite their fingernails by adding such endgame stakes to the actual mission and tying them to the expenditure of hero’s luck throughout the run of the entire story. And when any decision and any die roll throughout might decide whether they will keep or lose the dragon’s hoard in the end, you are most certain to have your player’s full attention! 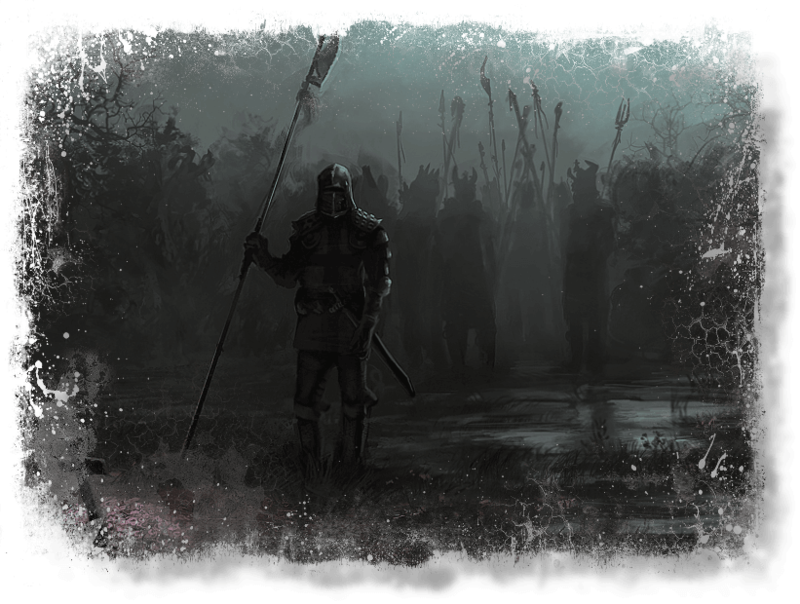 The main goal of Knights of The Black Lily‘s combat system is enabling you to run truly cinematic combats that emerge naturally from your dice rolls. One key feature in doing so is momentum: only a character who holds initiative has the right to attack and can rain down attack after attack until he loses initiative. The defender, just like in the movies, must fight for his life, always hoping for an opening to reverse the situation – or to cut down the enemy in a flash with a deadly counterattack. By introducing momentum, your fights will develop a narrative of their own, reminiscent of the greatest duels in fiction – for example, how one side got pushed to the brink of defeat, only to reverse fortunes but then having victory snatched from the jaws of defeat at the last moment after all. These are the kind of moments that you and your players surely will recount time and again even many years after, for the key to every memorable duel is in creating its own unique story of how it all unfolded. Knights of the Black Lily provides you with a rule system that produces such emergent dynamics in a simple and natural manner just as you roll the dice to resolve the combat! But it does not stop there: as in movie combats, characters get pushed around, thrown to the ground, tossed and tumbled, stunned and dazed. You might even manage to drive an enemy backwards and down a ledge – without having to resort to any special traits! Outmanveuvered: Attackers can create an opening in a strong enemy defense with a lucky dice roll, setting up tense, cinematic moments: can your partners-in-crime notice that you’re in trouble and interfere before you get cut down next turn? Outnumbered: Outnumbering forces rarely get to attack all at once but must come in waves instead. If your heroes face an overwhelming number of enemies, they may be able to cut them down one-by-one – just like in the movies! Outdone: Due to hero’s luck, your heroes will rarely get wounded but when they do it serves to only underline their heroism as they prevail in spite of! We call this highy cinematic combination of hero’s luck and wound penalties the mitigated death spiral. In summary, your fights in Knights of the Black Lily will be so faithful to fiction that uninitiated listeners to your party’s chronicles will not be able to tell whether you’re talking about a novel or a movie – or a combat in one of your gaming sessions! Want to learn more? If you’re intrigued, you may read all about the premise of Knights of the Black Lily right here.